Afghan authorities say the United States has paid tens of thousands of dollars to the families of victims killed in a shooting rampage allegedly by an American soldier. Kandahar provincial council member Haji Agha Lali Dastageri told VOA Afghan Service Sunday that authorities paid the compensation a day earlier during a ceremony in the governor's office. Relatives of the victims received $50,000 per person killed and $11,000 per person wounded in the March 11 shooting rampage in Panjwai district of Kandahar province. Dastageri said that the victims' families had requested that media not be present for the ceremony because of possible insurgent threats. A spokesman for NATO forces in Afghanistan declined to confirm or deny the payments, saying that while coalition members often make compensation payments, they usually are confidential. By Afghan tradition, those responsible for someone's death must pay the victim's family compensation to make amends. Earlier, an investigating Afghan delegation had paid each family a smaller sum in compensation. On Friday, U.S. authorities investigating the killings charged Army Staff Sergeant Robert Bales with 17 counts of premeditated murder and six counts of assault and attempted murder. 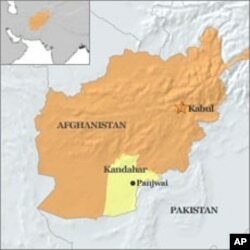 Bales, an 11-year military veteran, is alleged to have walked out of his southern Afghanistan military post under the cover of darkness and gunned down nine children and eight adults. The New York Times quoted an unnamed U.S. official Sunday as saying investigators believe Bales left his base twice on March 11, allegedly carrying out the shootings in two villages in separate operations. It was after his return from the second outing that Bales surrendered to authorities. Bales' civilian lawyer, John Henry Browne, has admitted that his client had something to drink before the shooting spree, despite a military alcohol ban, but insists his client has no memory of the night and was likely suffering from combat stress. Bales, who served three tours of duty in Iraq before being deployed to Afghanistan last December, suffered a traumatic brain injury in Iraq in 2010. A day before the massacre, he witnessed one of his fellow soldiers get his leg blown off. News reports have emerged that Bales has had past brushes with the law in the U.S. involving alcohol. He also is reportedly facing financial troubles at home, and had a $1.5 million securities fraud judgement issued against him several years ago. Bales could face the death penalty for his shooting rampage. The U.S. military has not executed a service member in five decades.